TeachMeets are a type of ‘unconference’ where teachers can share ideas with other teachers. 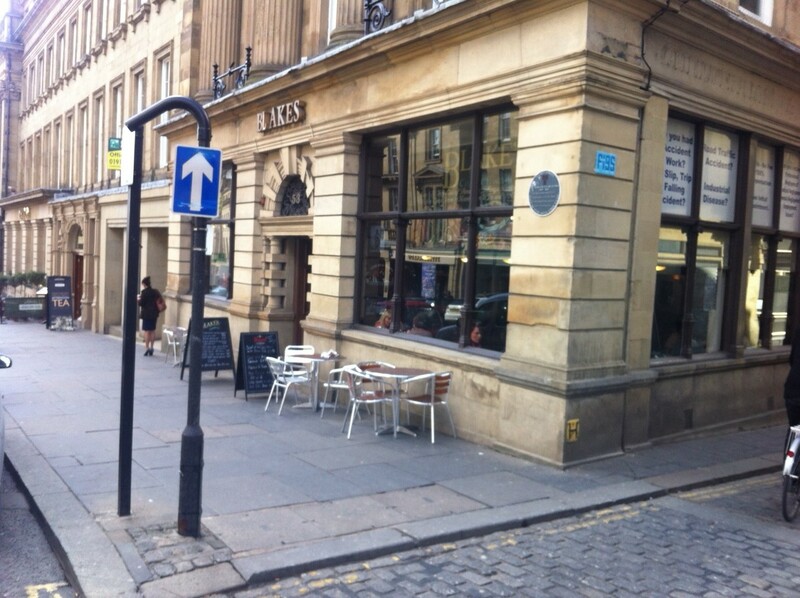 The #tmblakes13 TeachMeet took place at Blakes Coffee House on the beautiful Grey Street in Newcastle ( @Blakescafes ). While TeachMeets are informal, they do require organisation and the duo behind this event were Steve Bunce @stevebunce and Simon Finch @simfin. There was a mixed audience: teachers now working in consultancy, trainees teachers, special educational needs teachers, primary, secondary teachers… oh and a librarian. Just under 50 people signed up and around 30 attended, par for the course for a free event I think. I didn’t catch everyone’s name so I’ve used twitter names here. It turns out that if I wanted to see how a TeachMeet was run, I was told this was probably a bad one to come to (or maybe a good one?). Steve and Simon are exploring a different style of TeachMeet, even more informal and less structured – an experiment with an illicit style of ‘speakeasy’ TeachMeet, to use Simon’s analogy. The programme was relaxed – something was obviously going on because there was a laptop and projector in the corner, but the enjoyment of chat, coffee, wine and good food continued until someone stood up at the front and rang a bell to get attention. @simfin tested our listening and origami skills by talking us through how to create a folding book – this can then be used in a range of ways in your teaching session. Questions / problems were written on large envelopes and passed round the tables for everyone to add their answer. As the envelopes moved from one table to the next, answers and solutions could be shared. A raffle with prizes provided (I think!) by Filmclub @filmclubuk one of the sponsors – an educational charity helping schools to set up their own film clubs. Attendees were given a raffle ticket on arrival. 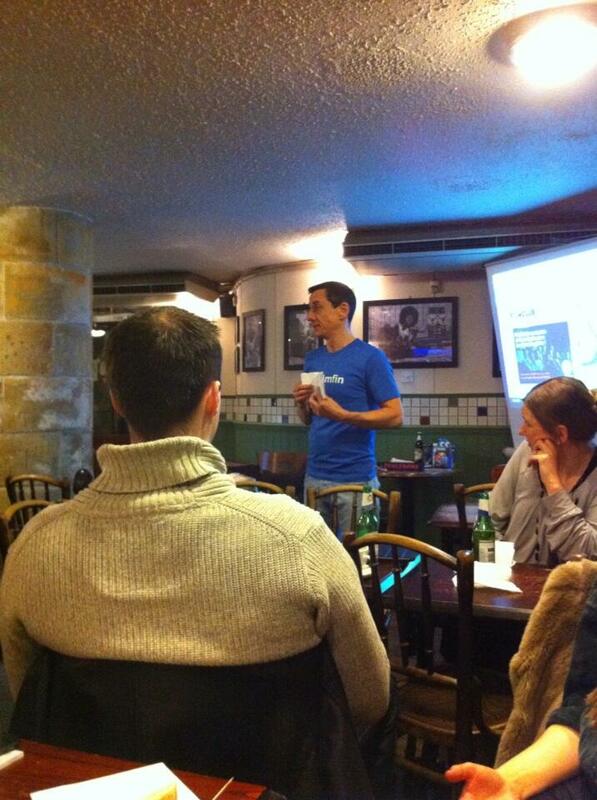 @chriswilde78 talking about Lego models & programming. Pupils create their own model robot and then have to learn how to program them – it sounds a fun way to learn. He also mentioned Scratch to create and share interactive stories, which I’ll have to investigate more. @beetlebug1 introducing Pedagoo.org ( @pedagoo) – an online community for teachers, that also runs face to face events such as the upcoming #PedagooSunshine. I loved the idea of their #PedagooFriday hashtag where teachers can share their achievements each week and a selection compiled for blog posts on the web site. @RachelOrr singing about her favourite blogs – amazing voice, amazing shoes! I’m a librarian working in a university, so why did I attend #tmblakes13 – a TeachMeet aimed at teachers in schools – and what did I get out of it? Ideas & inspiration. Librarians do teach and some of them teach a lot – I’m one of them and I enjoy it. Like many librarians however, much of my knowledge is picked up ‘on the job’, although most end up pursuing some type of teaching qualification. I wanted to get ideas to improve my teaching and I also wanted ideas about how to run a TeachMeet. I first came across the concept of a TeachMeet when it was adapted by some librarians in Cambridge to become a ‘LibTeachMeet’. I organised ToonLibTeachMeet back in May 2011 and have another planned for this July, so I was looking for inspiration. I did get ideas and learned a few new tips for teaching – obviously I do have to be selective as not everything can be transferred to a university or library environment (ClassDojo sounded a great classroom management tool, but not that appropriate for my context). I do find those working in the schools sector to be quite creative and many of the more game-style techniques work well, but to a certain extent I feel weighed down by my perception of student expectations – are more formal, traditional types of teaching expected in a Russell Group university? But I will be certainly be trying out some of the ideas I picked up to test whether my perception has any truth to it! Reassurance. Over the years I’ve run ‘train the trainer’ workshops, I’ve worked with a lot of librarians in universities, colleges, public libraries and schools who are involved in some kind of teaching. I often encountered librarians who were lacking in confidence about how they compared to the ‘proper’ teachers. Also, after years of training staff in the education sector, I still feel a relative novice at teaching students, so I was hoping to learn from those used to teaching younger age groups. However, dipping my toe into a TeachMeet for ‘proper’ teachers, I think many librarians could hold their own, both in terms of innovation and knowledge of pedagogy. One difference I did find was that most attendees at #tmblakes13 had come prepared to say something, whether in a more formal mini ‘presentation’ or just an impromptu contribution. I think many library staff are still building their confidence and might find this daunting. Breaking out of the echo chamber. I like to meet people from different sectors – probably a hangover from my days at JISC Netskills where I worked on projects with all sorts of people. I find it fascinating to see how different sectors address the same issues and explore the issues that are unique to particular sectors. While I love to share with librarians, it’s always good to see what else is going on and I wanted to meet some new people to be inspired by. I’ve now managed to create a nice core of local teachers/educationalists to follow on Twitter, which I can build on. Sharing. It wasn’t all ‘take, take, take’ on my part though – I did bring along some freebies to promote the Teachers’ Toolkit – a set of (mainly) free resources that the Newcastle University offers to schools, including some resources based on the Library’s Special Collections. I hope at some point to share more about what I do in the hope it might be useful from a teaching perspective. 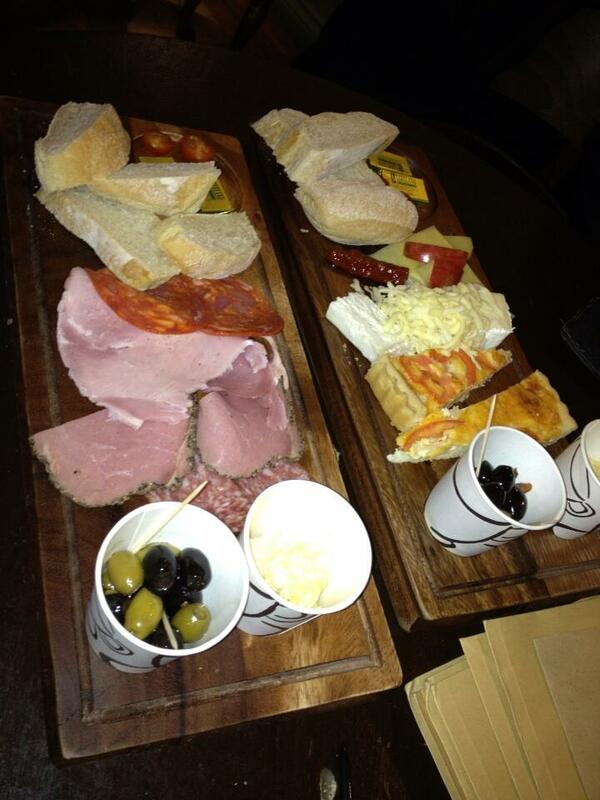 I’ll finish with a picture of the food – if that doesn’t tempt you to come along, nothing will! I recently sat in on two JISC Digital Literacy webinars run as part of the Developing Digital Literacies programme. I’ve written reports on them both (here and here) but in this post I’m trying to draw together emerging issues and themes. I work in a university library, supporting students and researchers, so am inevitably involved in information and digital literacy. I also sit on the University’s Digital Literacy Steering Group which is looking at skills for administrative staff. So my interest in digital literacy is quite broad ranging and it’s great to hear about activities in this area. The two webinars covered HE and FE separately, but I sat in on both as it’s interesting to hear how issues are being approached in different sectors. Not all of the projects were presenting and they have yet to deliver their outputs – final reports are due this summer – so conclusions are tentative, but I found some key themes emerging. Some of the issues are very familiar, but others not so much. Location, location, location. Approaches are being tailored at different institutions and also within an institution. 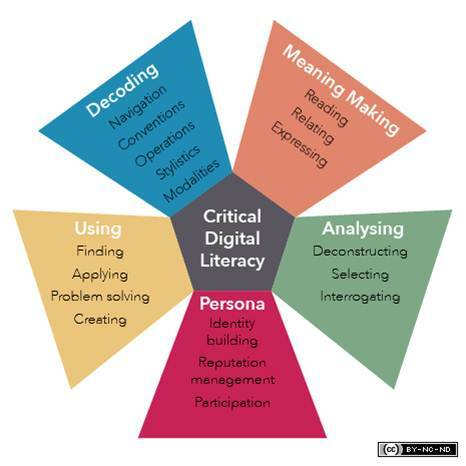 Institutions are developing their own definitions and models of digital literacy that work for them (eg Greenwich 5 Resources model), but even then strategies need to be flexible. The University of the Arts London highlighted in particular how they have varied their approach depending on the department/college/subject etc. I expected approaches to vary but was a little surprised at how new definitions and models are being created – I would have thought it would be easier to market something that is already recognised and established, but it seems that tailoring is proving to be common. I wonder if the same trend is being observed across HE and FE? Digital champions/heroes/e-guides. Using individuals embedded within departments/sections to provide examples of good practice and a source of support was common across HE and FE. Communities of Practice. These were also common but implemented in different ways. The communities at UAL were self-identified so it will be interesting to see how they compare to other more ‘guided’ communities. Coleg Llandrillo found they had the ‘Creepy Treehouse‘ problem with some of these more directed communities – meaning that communities set up by tutors were viewed with suspicion by students. Colleg Llandrillo also experimented with a range of platforms to support communities, not being limited only to a single institutional platform. Accreditation. Use of accreditation in FE through the units at the Open College Network for both staff and students – would this work in HE where accreditation is a more complex issue? Confidence vs competence. The confidence of staff and students often outweighs their actual competence. This issue is regularly found in research into information literacy, so it’s not surprising to see the same with digital literacy. Worcester College had demonstrated evidence of this by testing staff and students and then comparing this to survey responses. Tasks vs technologies. How to approach the problem – focus on technology or what you are trying to do with the technology? Or does it depend on the learner? I suspect the answer is both approaches should be used depending on what’s most likely to succeed – some like to find out about a technology they’ve heard of, others need to see the benefits to their role. 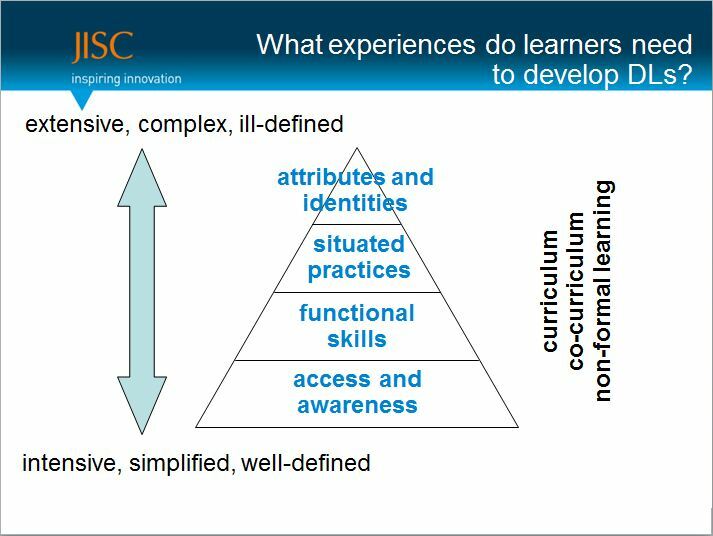 However, with a technology focus are there more dangers of reaching only the bottom levels of Beetham & Sharpe’s learning literacies development pyramid, i.e. access, awareness and functional skills, and not affecting practices and attitudes? Most projects were aiming for institutional embedding, thus implying a close link to practice, but some of the staff development offers were technology focussed – how is the link drawn between technology and practice? Some can make that leap for themselves, but others need to be convinced of the value of a particular technology in their role. I’ll be interested to see more detail of how specific digital literacies were addressed. Providing a variety of delivery methods for training. Some projects are finding face-to-face successful whereas others are using online delivery. Once again does this depend on ensuring the right method for the learner? However, provision is usually constrained by the resources available. ‘Empowering’ staff and students. For example, the student change agents at Greenwich, the self-identified communities at UAL and the micro-projects at Reading. Ensuring that learners are part of the solution and that digital literacy isn’t just ‘done’ to them seems a successful approach. Embedding within CPD processes. I’m really interested to see how digital literacy has become embedded in for example, appraisal and PDR processes – Plymouth in particular highlighted achievements in this area, along with successes via accreditation in several of the FE colleges. Marketing ‘digital literacy’. This wasn’t really touched upon, but I’m curious to know how widely the term ‘digital literacy’ has been used. Has this proved a popular term or is it confusing? Evidence of impact. Digital literacy hard to measure and evidence but has impact – this view was presented by Prof Neil Witt from Plymouth, quoting Lou McGill from the Curriculum Delivery Programme Synthesis: “whilst impact on the whole institution is harder to measure and present as evidence, but has much more significance in terms of sustainability and embedding. Funders should continue to value this ‘softer’ evidence”. This is a point that I think is crucial to winning over digital literacy sceptics and remains a challenge. The Reading project did describe a body of evidence as a key output so it would be interesting to see what they found. Opportunism. Taking advantage of organisational changes to implement digital literacy initiatives (Reading & Plymouth). Here at Newcastle University it’s our Digital Campus programme driving change. More about change than skills? While digital literacy presents obvious staff development issues relating to use of technology, these projects are showing that it is also about changing attitudes and cultures. There’s no point in having the technology available if it is not used or not used well. Programmes not projects? The range of activities carried out within the projects indicates that they are more like programmes than projects. Sustainability. How will these projects ensure long term impact? UAL has secured further funding and Reading has achieved genuine buy-in from the senior management. No one size fits all solution. Success requires a range of approaches, with no single solution, including top-down and bottom-up approaches. Digital literacy can be seen as too big and too complex to address, so it was good to see the projects looking like they are achieving some success and I hope they deliver some practical guidance. As the presentations given were brief, there was not much detail on the specific digital literacies that were being addressed – I’m looking forward in particular to hearing about how the critical aspects of digital literacy are being tackled. Finally, I’ve discovered the Digital Literacy Project Index on the JISC Design Studio where the projects place their outputs so far, so that’s worth keeping an eye on. Lots of exciting activity around digital literacy at the moment! This is the second in a series of webinars in 2013 run by JISC as part of the Developing Digital Literacies programme. I’ve written up the first webinar and also put together some thoughts on emerging issues and themes. The presentations and webinar recording are available here. This project approached digital literacy by focussing on the tasks and activities people are doing (an approach I approve of!). Again, like most projects they are looking at embedding digital literacy not tagging it on separately. They have developed Bitesize learning as part of basic/essential skills. They have also used Information Literacy Agored Units via the Open College Network. They have found an increasing focus on digital citizenship. Some specific activities include using iPads in senior management meetings, webinar software being used for staff training and teaching (go2meeting), peer e-guides providing a point of contact, support and advocacy and support materials in Moodle. Communities of practice have been created using lots of different applications – I liked the fact they are trying out different tools rather than being limited to a ‘supported’ institutional platform. So far the most successful community is run by library staff on Google Plus. Worcester carried out a survey of 240 staff and students, observing 4 areas: ICT, social tools, multimedia and information. There were differences between staff and students – staff felt more confident in information and IT skills but not up-to-date with new tools such as social tools. Students had more confidence in social tools and multimedia. However, the results showed confidence but not necessarily competence. This was observed when staff and students were asked to carry out information seeking tasks alongside each other, while being observed by library staff. Online delivery of these units proved popular and these are now embedded into the staff CPD offer on a permanent basis. They are planning to look at impact on achievement – students like the print out certificate at the end of the units so this may have an impact on completion rates. Ross outlined the risk of not addressing digital literacy with staff (by this he meant mainly tutors). Some consquences include teaching that did not have active engagement and didn’t reflect the real world. The opportunities provided by using technology for differentiation, assessment and accessibility, are missed. Issues preventing the improvement of staff skills were lack of time, no desire to change, poor training being provided and staff stuck in fixed methods of teaching. Ross cited research that related social networking to Maslow’s hierarchy of needs and that it is now a need for students which is being missed (I must find this research!). 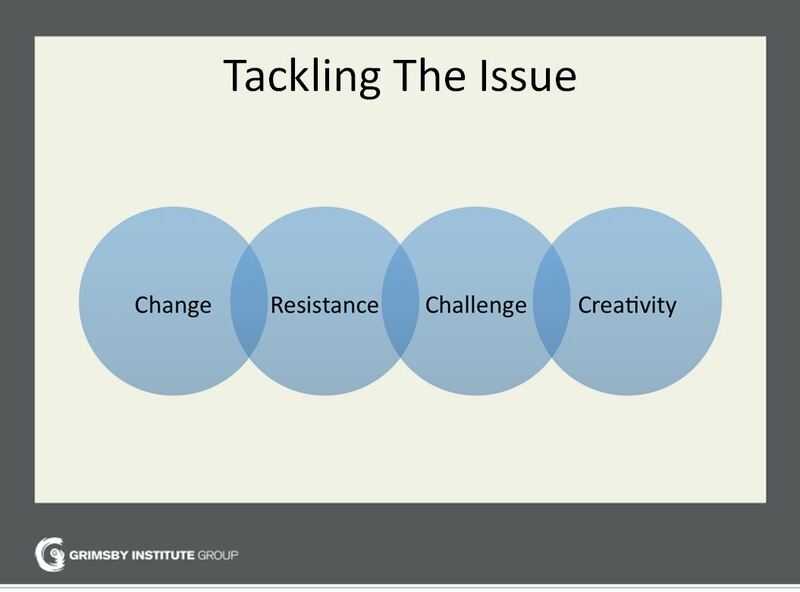 I thought this was a really positive way of looking at it – rather than seeing resistance as a negative, using it as a driver to find more creative methods of overcoming resistance. A question did arise about whether the above sessions could be tipped on their heads to address specific problems rather than technologies – again a key question in terms of the approach to digital literacy. Read more about Emerging Themes from JISC Digital Literacy Projects. I sat in on a couple of webinars recently as part of the JISC Developing Digital Literacies programme. I’m really enjoying webinars – it’s a great way to keep up-to-date and network in your lunch hour! I’ve written blog reports on two webinars, this one and ‘Rising to the Digital Literacy Challenge in FE’, along with a post trying to bring together emerging themes and issues from both. The presentation is below and the webinar recording is here. Sarah Davies introduced the session, explaining the JISC Developing Digital Literacies programme which includes 12 digital literacy projects across HE and FE running July 2011-2013. Helen provided a more in-depth overview of digital literacy and the JISC work so far. She highlighted that it’s now quite normal to talk about Digital Literacy (DL), which for her is a step-change within the JISC. A major challenge is that institutions are constantly adapting to and adopting new technologies, which are not always within their control. Digital literacy is therefore about developing capability, human development and people’s potential with technology. She reported that the JISC definition has been helpfully broad: ‘The capabilities, aptitudes and attitudes learners need to thrive in a digital economy and society’. Helen pointed out however, that institutions have adopted different definitions that work for them. Helen highlighted that personal identity is increasingly an issue for students and staff, so DL is not just about acquiring skills, but can affect who you are in the world. Helen described a pyramid model showing a hierarchy of digital literacy – with functional access at the bottom, through functional skills, situated practices and with attributes and identities at the top. I do find this a useful model to demonstrate that developing digital literacy is about more than just IT skills and that the increasing complexity as you move up the pyramid probably explains why the focus remains on the bottom levels. I will be interested to see how the project address the various levels in the pyramid. (See also Beetham & Sharpe’s more detailed Learning Literacies Development Pyramid [Word doc]). Helen explained that all the projects started out auditing their institutions looking at infrastructure, strategies, cultures, attitudes, role of professional services, curriculum practices relating to digital literacy (auditing tools available on the JISC Digital Literacy Design Studio site). A key message was that there was no single solution to addressing digital literacy – a range of approaches appropriate to institutional and individual contexts are more likely to succeed. Opportunity 1: Being able to provide input into the strategy. The university had a digital strategy with four themes with the word ‘digital’ in them, so it was straighforward to demonstrate a staff development need around digital literacy throughout the strategies (Digital People, Digital Teaching & Research, Digital Services, Digital Infrastructure & capability). Heads of School are also now making DL part of departmental strategic plans. Opportunity 2: Working with HR embedding Digital literacy into the PDR process. The university was moving from an appraisal to a Professional Development Review process, so the project worked with Heads of School and HR to identify digital skills across the board. I look forward to seeing more detail about how exactly digital literacy is addressed in the PDR process. Opportunity 3: using Restructuring A major restructure allowed digital literacy roles to be embedded – these revised job descriptions and roles will be made available. Neil has Subject Librarians, IT and Learning Technologists working in 3 teams – Digital Skills & Development, Engagement & Support and TEL & Assessment. He reported that librarians were working with new aspects of digital literacy – I’d be interested to hear more about this. Nadja’s project has a broad scope, aimed at all staff and students, but with a focus on student employability. Despite the challenges of this, she now appreciates what can come out of approaching an issue from all angles. Nadja described institutional barriers to change at Reading, including no formal strategies, a risk-averse culture, silos with pockets of good practice and various levels of digital literacy. However, some major organisational changes, including a new VC, were taking place so this provided opportunities. Bottom up: Digital community building & upskilling through showcasing digital ‘heroes’, micro funding for mini-projects, social networking on campus (including a blog, newsletter and Yammer) and formal and informal events & training opportunities. Also a strand of research is taking place around the area of student employability, covering student attitudes to and use of technology. Top down: Senior management engagement has been successful, with the digital literacy steering group being made up of Heads of key professional services. The VC and PVC for Teaching & Learning were involved from the beginning and are now genuine champions for change, which has been instrumental. As a result of the project activities, there is now a genuine commitment to Digital Literacy in senior management, reflected in such strategies as the TEL Strategy and a Memorandum of Understanding with Futurelearn to provide MOOCs. They also have a body of evidence to inform strategic decisions – it would be useful if this was shared as part of project outputs. The aims of the project are cultural change and improved graduate employability. Their approach involves self-identified communities for improving digital literacies. It soon became apparent that this was actually a programme not a project. The outputs were found to be difficult to measure, until the realisation that the outputs were actually the networks, alongside more tangible outputs such as resources and handbooks. An interest group, Understanding DL at UAL explored definitions and competencies. UAL is addressing these needs in their own way and this varies across departments, subject, course, colleges and central services. For example, some departments have digital champions embedded and some don’t. There were project groups to support academic and curriculum integration and this worked well. Extra funding has been secured to provide sustainability. As part of this longer term approach, the DIAL brand (which is quite strong) will fade away. This project involved staff and students and focussed on graduate attributes in transition – from the move into university and then out of university into employment. Embedding DL into the curriculum and supporting staff in this. Key issues were how to deliver a large scale institutional change project in such a short time? How could they foster accelerated buy-in? How could currency be ensured? How could sustainability be developed? A cross university research group worked on the project, using students as change agents. E-magazines were created in faculties with staff and students as ‘e-editors’. Students developed workshops and resources. Gains from the project activities were that students were recognised as valued contributors of change. Discussions took place that would not have otherwise happened. There was excellent access to the student cohort and was therefore ‘on pulse’. It also provided a new way to meet institutional KPIs – I’d like to hear more about this. There is also a open Ning community called Digital Literacy in Higher Education run by the project which I’ve joined. It would be great if there was a community for all institutions involved in addressing Digital Literacy issues could exchange ideas and good practice – perhaps this is the place? I’m experimenting this year with using LibGuides deliver teaching materials and activities, instead of printing handouts. This year we’ve rolled out our single Library Search (Primo) which makes searching a lot easier, so my rather detailed and prescriptive handouts from last year were obsolete. 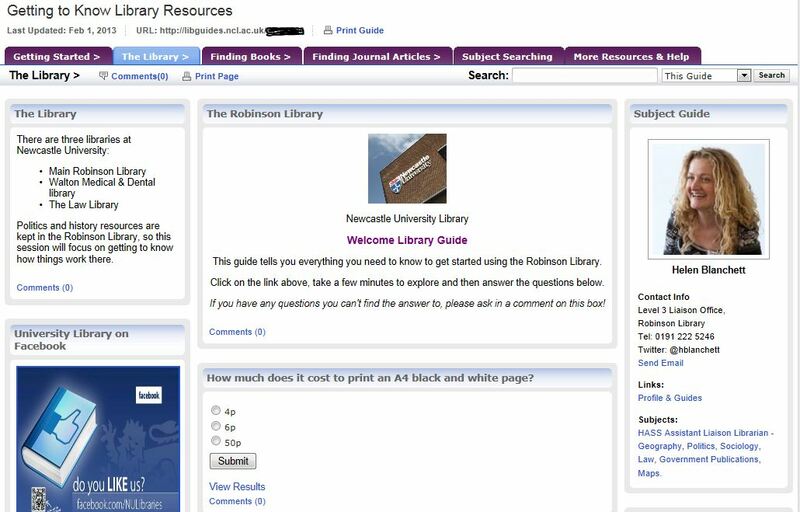 We’ve taken to LibGuides quite enthusiastically here, so we have a range of subject Library Guides (as we’re calling them), along with more specialist guides relating to for example, government publications or referencing. I started trying to use LibGuides more interactively last year, using the comments facility on boxes to get feedback from activities. This session was to support second year students in dissertation preparation and was the last in a series of three sessions I ran. 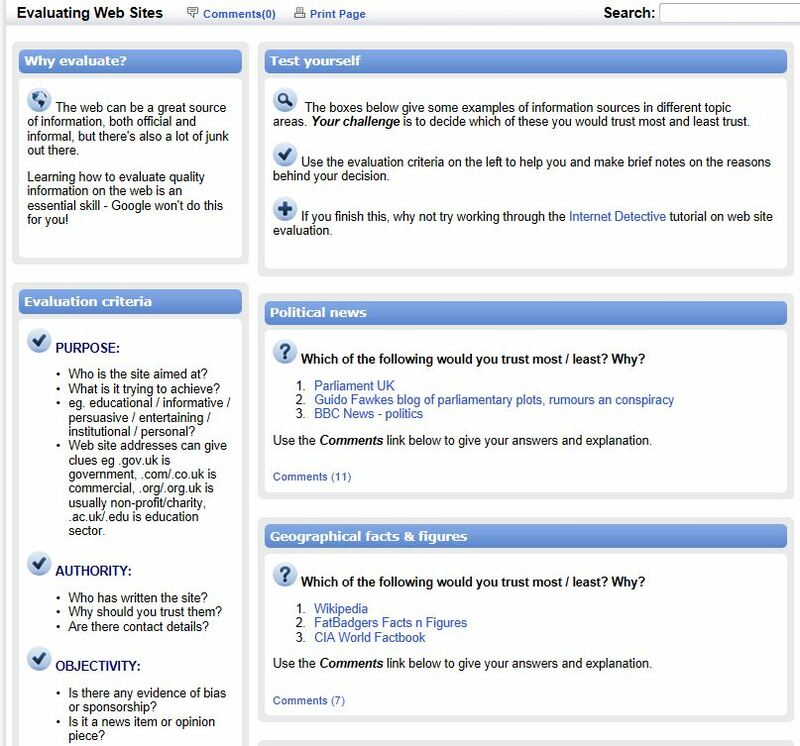 I set up a page focussing on evaluating web sites, containing evaluation criteria and links to sites I wanted students to look at and asked them to put their thoughts in the comments boxes. It worked surprisingly well and was a great way to get feedback from a group of over 60 students. There was the odd person posting flippant comments, but it actually made it more entertaining! This was a fun session to run. They are tried and tested examples which I know will provoke a reaction. It was good to be able to get a whole group of 60 + interacting with each other, both by working in small groups and feeding back on the LibGuide and thus interacting across the group. I was quite happy with how the students evaluated the sources and they surprised me with their view on the bias of the BBC! For once I have to say I was pretty happy with how the session went, although it didn’t go quite as well this year (see below). I did have some issues with students posting some borderline offensive comments anonymously about another student in the room. I chose not to moderate comments and this would have slowed down the ‘real time’ interaction, so this is one of the potential hazards. I’ll give stronger advice next time ensuring comments are appropriate. Having a colleague on hand to delete any offensive comments would be handy. The second time I tried this it didn’t work quite as well. Unfortunately the lecturer wasn’t there to assist in the session and it’s amazing how different the level of engagement is when they aren’t there. Could be the nature of a different group but who knows! This year I tried using LibGuides in a different way – to replace the usual handouts and to provide a focus for activities during the session. I was teaching Stage 1 Undergraduate library induction sessions and I created a separate LibGuide for each subject session I was running. The guides were private, which meant the guide could only be accessed by a direct link. I introduced the guide which started with a question for students to rate their information skills. As I went through my presentations/demonstrations, I guided students through the sections of the guide for the hands-on activities. The activities included links to resources and questions to answer using those resources. I designed the questions in order to ensure students learned specific skills eg how to find the shelfmark for a book, how to access an e-book, but also to try to get them thinking about the resources. For example, I’d had feedback from lecturers that students didn’t know the difference between a textbook and other types of book that present research/opinion etc, so I got students to read the descriptions of the books to find this out, which also hopefully teaches them how to find out information about the resources at the same time. The initial question about rating their information skills was interesting. Very few rated themselves as ‘brilliant’ or ‘abysmal’, with the results split between the middle two responses of ‘Pretty good’ or ‘I get by’. Surprisingly, ‘I get by’ had the edge, suggesting the Google Generation isn’t overly confident as we often assume (ok this is just a brief indicator!). It was useful to be able to refer to the responses to questions as we went through the session. It provided some way of testing student learning. 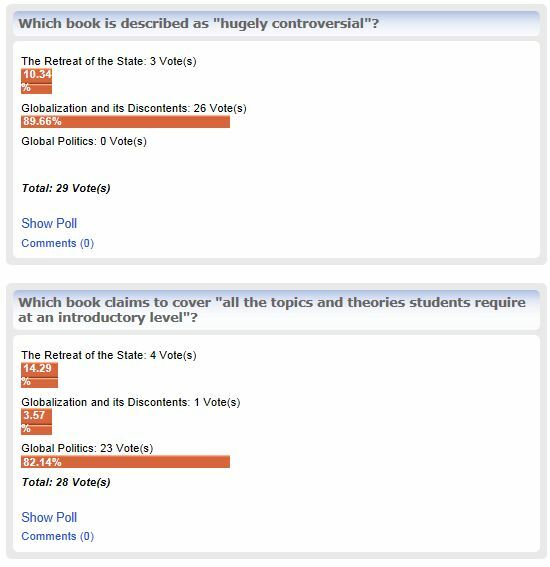 The questions were created using LibGuides ‘poll’ tool, which means that it doesn’t give answers. This works well for use during a session as you can just present the responses and give the answers verbally. This wouldn’t work so well if you wanted to use this more as a standalone online tutorial. I saved a few trees by not having any handouts! I could update the guides immediately if I needed to, enabling me to respond to feedback quickly. For the first session I had also added a WallWisher widget to the guide encouraging students to share their usual/favourite information sources. This didn’t work too well in the first sessions – a couple of students used the wall to say ‘hi’, but I had some feedback to say they wanted ‘less of the stickies’, so I decided to drop it for now. I know colleagues have had more success with this, so perhaps I need to persevere. I overestimated the students’ abilities to move back and forwards between browser windows – they needed to keep the LibGuide in one window while exploring resources. Few students bookmarked the LibGuide so I had to leave the address up on a flipchart. There was some confusion between the LibGuide I was using for the session and the subject Library Guide I was asking them to explore. I would have preferred the sessions to be more interactive. Students tended to work individually, interacting with the screen despite being asked to work together. I think I’ll keep trying this approach for working with large groups and it works particularly well for the evaluation sessions. I don’t think I’ll go back to printed handouts as they just aren’t needed anymore. I’ll carry on using LibGuides as the basis for the sessions but I want to work on getting more interaction going between the students and between myself and the students. As I become more familiar working with undergraduates I’m sure that will happen. I’d be interested to hear if anyone else has tried similar things – what worked / didn’t work for you? I’m already way behind but I’ve made a promise to myself that I won’t give up despite falling behind. I’ll be like that man who did the London Marathon in a diving suit who finished days later. Thing 2 is to explore other CPD23 blogs and comment on them. I have looked at the list on delicious and it’s great to see such a long list. I dipped into quite a few blogs and plan to keep dipping in throughout the time I’m doing CPD23. It’s great to see such a mix of people following CPD23, both new and established professionals, individuals and teams, all from a range of sectors and countries. I’m quite keen to see international viewpoints so will make an effort to seek out librarians overseas. I do like the latest posts feed that appears on the CPD23 blog so I’ll keep an eye on that too. I think this sums up how I ended up as a librarian! UPDATE – Unfortunately I was far too optimistic thinking I could keep up with CPD23 while on maternity leave… it doesn’t look like it’s running again this year but I may still dip into the posts anyway! I’m finally publishing this blog as part of the 23 Things for Professional Development (#cpd23) programme. Thing 1 is to create a blog and explain why I’m taking part in the programme. But to my shame have never started my own blog. Of course I have many excuses – Who am I writing for? Will I have time? Who will be interested in what I’m saying? At Netskills I worked on many diverse projects and thought this would be confusing for any potential ‘audience’ for my blog. Now I realise I’ve missed the point. This blog is actually for me. But if others find it interesting then that’s a bonus. I’m not a natural reflector – I’m more of a do-er. I will reflect on the success or failure of projects and how to do things better next time, but I don’t tend to reflect in such a considered way on my own development, which is ironic for someone who is so interested in CPD! So I hope this blog will encourage me to do that. I also realise now that the diversity of the projects I worked on at Netskills put me in quite an interesting position. I don’t work there now but I still have that experience and retain those diverse interests which I hope will give me a viewpoint worth sharing. I’m currently off work on maternity leave after starting work back in libraries. 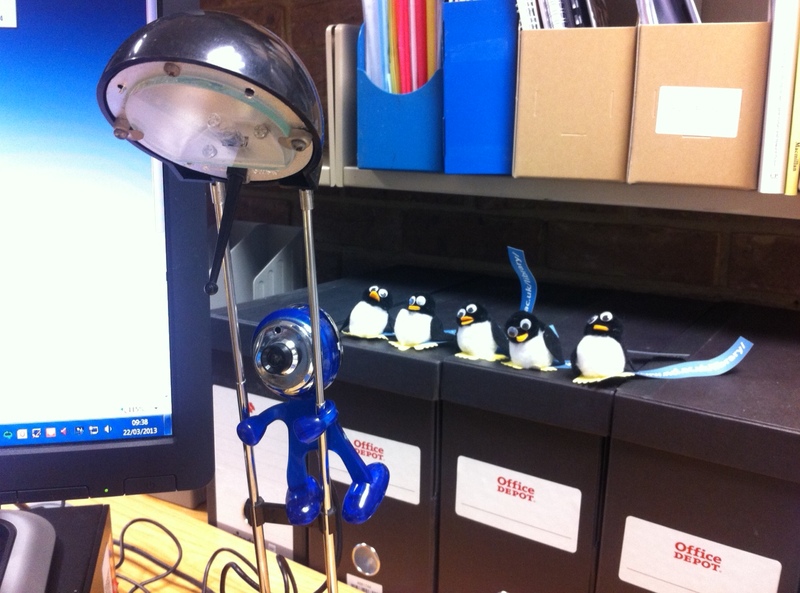 I took a new role as Assistant Liaison Librarian at the Robinson Library in Newcastle University last July. I started out in libraries and over the years I’ve trained many librarians from all sectors, so I’m back experiencing it all first hand again. I’m using the 23 Things for Professional Development programme as a catalyst to starting this blog, but also this is an opportune time for me to reflect on my career. I’m facing new challenges in my recently changed role so I think this is a perfect time to finally get over my blogstipation (‘1. noun. To be unable to think of anything to blog about, i.e. writer’s block for bloggers’ – from another favourite demo from blogging workshops – the blog glossary). The title of this post comes a presentation I’ve seen given a couple of times by Maxine Miller, Collections Development Manager at the Tate Gallery (at the CDG/PTEG Raising the Bar conference & CILIP New Professionals day – both in 2010). I found her to be an inspirational speaker and enjoyed listening to her describing her career, the challenges she faced and the experiences which proved pivotal for building her confidence and self-belief. Something that has stuck with me was her advice that sometimes you need to challenge yourself to try new roles and acquire new skills that may not come naturally. But she assured, you’ll find you can achieve goals if you are confident in who you are – say “this is me, this is who I am and I say what I do because of it”. So this is me and this is my blog.